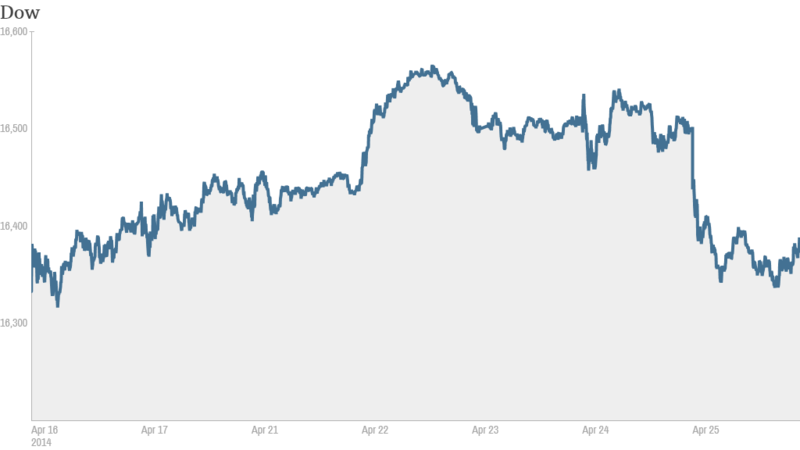 Stocks: Federal Reserve to the rescue this week? Click image for more market data. Janet Yellen and economic data are poised to steal the business spotlight from Corporate America this week. After a bonanza of corporate report cards dominated recent headlines, investors will likely refocus on the state of the U.S. economy and the Federal Reserve's delicate dance to curtail its stimulus measures without roiling markets. They will be looking for positive news to turn things around after the market downturn last week and a lot of choppy trading so far this year. The early attention will clearly be on the Fed, which is widely expected to dial back its bond-buying exercise by another $10 billion following a two-day meeting that concludes on Wednesday. Investors will sift through the central bank's policy statement for clues on when Yellen and Co. might embark on their first interest rate hike, a thought that has spooked some on Wall Street. The Fed may also hint at whether it believes the recent uptick in economic data will persist. A brightened outlook could signal the central bank will continue, if not accelerate, its exit of quantitative easing. There's no scheduled press conference following this meeting, meaning Wall Street doesn't need to worry about a repeat of last month when Yellen inadvertently riled the markets by fumbling a question about rate hikes. But the clearest evidence on the health of the U.S. economy will come later in week in the form of the April jobs report. Forecasters believe the government will report that U.S. nonfarm payrolls jumped by 204,000 jobs in April, improving upon March's estimate of 192,000. But watch for revisions to prior months and the unemployment rate, which could tick down to 6.6% from 6.7% in March. Wall Street will also take a look at GDP figures, which offer the broadest view of economic health. Due to weather-related headaches, first-quarter growth is seen tumbling to just 1.3%, down from 2.6% in the fourth quarter. All of this U.S. economic news could easily be superseded if the situation between Russia and Ukraine intensifies. World markets, especially in Europe, fell on Friday thanks to the deteriorating economic -- not to mention political -- situation in Russia and Ukraine. Investors will weigh all of this economic and geopolitical news against more corporate earnings reports. Top consumer brands including Buffalo Wild Wing, (BWLD) Domino's Pizza, (DPZ) Expedia (EXPE)and Sprint (S) will reveal their latest numbers. PayPal owner eBay (EBAY) is also scheduled to hit the earnings stage on Tuesday. The e-commerce behemoth is expected to log per-share earnings of 67 cents, down from 70 cents the year before. EBay recently ended a war with Carl Icahn over the billionaire activist investor's push to spin off PayPal. The activist investing community will certainly tune in when Herbalife (HLF) logs quarterly results on Monday. The controversial nutrition company, which recently disclosed a probe from the Federal Trade Commission, has been under assault from billionaire hedge fund giant Bill Ackman. Twitter (TWTR) is scheduled to report earnings for the second time as a public company on Tuesday, with analysts expecting the micro-blogging site to narrow its loss to 3 cents per share, down from 8 cents a year ago. Twitter shares have shed a third of their value this year as investors back away from momentum Internet and biotech names. Investors will also get a glimpse into the world of energy producers this week. Chevron (CVX) and ExxonMobil (XOM), the world's largest public energy company, are scheduled to log results on Thursday and Friday, respectively. Other notable earning reports on tap for the week include Ameriprise Financial (AMP), Bristol-Myers Squibb (BMY), Goodyear Tire & Rubber (GT), British soccer club Manchester United (MANU)and Standard & Poor's parent company McGraw-Hill Financial (MHFI). Wall Street will also be digesting the latest real estate data, including an industry group's report on March pending home sales and the S&P Case-Shiller's look at February metro home prices. As if there isn't already enough on investors' radar, the manufacturing sector will also be in the headlines. The Institute for Supply Management's closely-watched PMI index is expected to show on Thursday that activity improved slightly in April, while the government's factory orders report is set for release on Friday.